Most fiber optic cabling products are tested for insertion loss and return loss on the component level. In order to give our customers the best possible product, the Chameleon takes testing one step further by performing a total link test. Each full link is tested as a completed assembly with each system link being tested for Insertion Loss and polarity verification. This final testing ensures a repeatable test result in the field. Each component is serialized and labeled in the order that they were tested for ease of installation. And the customer is provided with a Certificate of Conformance with each set of cassettes, patch cables and backbone cable. @850nm = 1.98db - average loss across 10 connectors. @1300nm = 1.79db - average loss across 10 connectors. 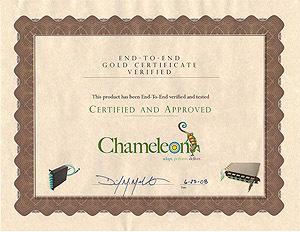 Each Chameleon High Density cassette comes with its own set of tested and verified MTP brand-LC patch cables. 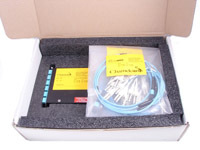 Additionally each Chameleon system ships with the Cassettes, Backbone Harness and patch cables all packaged as a total link to help ensure field installation and performance reliability. Cable harnesses are shipped on wooden reels or standalone depending on the length of the cable. The connectors are held securely in the top portion of the reel to ensure that they won't be damaged in transit.